Saun-Joo Yoon’s research focuses on use of complementary and alternative medicine (CAM) to manage chronic health conditions in ethnically diverse populations and in older adults. 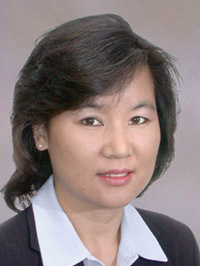 The importance of her efforts in aging and CAM research have been recognized by two prestigious awards: the Hartford Institute Gerontological Nursing Research Scholar (2001) and Summer Institute on Aging Research Scholar by the National Institutes of Health, National Institute of Aging (2006). Yoon’s study on CAM use as a self-care activity in older women, which was funded by the Alpha Theta Chapter of the SigmaThetaTau International Honor Society, revealed that over 45% of older women used herbal products to maintain health as part of their self-care practice. It was also discovered that non-standardized ingredients/dosages among herbal products, and lack of communication between clients and healthcare providers proved to be problematic. The original study was replicated among a sample of African American women to understand differences between two ethnic groups. This study revealed great ethnic differences in sources of information to obtain herbal use and in types of herbals people used. African American women used herbals more for treatment than for prevention, perceived themselves in poorer health, and reported more chronic health problems than White American women. Findings also suggested a significant correlation between the number of herbals and non-prescribed medications used and self-reported health problems were significantly related to only the number of prescribed medications. It was hypothesized that women might be using herbal products as complementary rather than alternative therapy. Another area of study for Yoon is pain and the elderly. Since pain is a major problem for many older adults and pharmacological approaches are not always effective, non-pharmacological approaches in combination with better pain assessment/management strategies are needed to achieve optimal outcomes to relieve pain. Yoon conducted a pilot intervention study, funded by the National Institutes of Health, to examine effects of glucosamine with chondroitin (dietary supplement) to manage pain in persons with osteoarthritis. Results suggested potential functional improvement but no structural changes in six months after the intervention. Relationships among ethnicity/race, physical/social functioning, and pain in older adults were also examined to understand ethnic differences/disparities in pain management.